eWorld is Dead. Long Live eWorld. eWorld: A long long ago project in an Apple galaxy far far away. 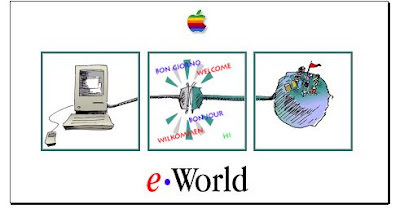 Got a call from a writer a month or so ago writing a story on eWorld, the last big project I worked on at Apple back in the 90's. It's a pretty good write up. Worth a read if you want to know a little about a tiny corner of the beginning of the internet. The author (Rob LeFebvre) talked to me as well as several of the key folks that originally started with the eWorld project (Cleo, Peter, Trevor, Chris and Jenna... all great folks) to get the real story, almost 20 years after the fact. Looking at the artwork from way back then, it's still beautiful to my jaded eye. It's a shame Apple didn't 'get it' back then. Peter (our GM/VP) tried so hard to get the (various) CEO's to understand. I think we went through 3 during the lifespan of the project, which wasn't all that long. A sad time at Apple.